When your friend knows that you have a book on your shelf that you were supposed to be read and you can feel her giving you a look even though she is not in the same room as you nor in the same state, that is when you know it is time to read the book. (I am pausing here). I feel like I had to pause for a little bit of a dramatic effect because I do not know what i just read (I actually do know) but I am hating myself more and more for taking so long to read it. In the story we follow a girl, Juliette, who has been locked up in a cell for over 250 days, no contact with anyone, and hanging on a very small string to survive. However, things start to change when she gets a new roommate. Juliette is finally pulled from her prison and introduced to where she has the option of helping the Reestablishment or fight back. I do not know how Juliette managed for so long. I would been twice if not three times as scared and the very thought of continuing on would be slimmer. However, the moment she is pulled from her prison, we see a new girl emerge. A girl who sees another opportunity to fight, another opportunity to find love, and another opportunity to finally be free. Juliette came out of her shell and she has become this fierce heroine that readers, especially girls, can look up to and find their own inner strength. When talking about the men in the story we have two polar opposites, Adam and Warner. Adam was a character I had to warm up too, but thankfully it did not take too long. Warner on the other end is on my "hate" list. However, there is something about Warner that is holding my interest and I am curious as to know more about him and his past. I cannot tell you what it is exactly but there is something there. While Adam is sweet caring, loving, and dependable. Warner is cruel, ruthless, and a pain in the rear. The perfect Ying Yang combo. Now I know I am coming to this book super late but this book did turn up the heat multiple times. The relationship between Adam and Juliette is HOT!!! However, I do not know if I am fully in support of it. Because, and I know I am probably going to upset some people, I have this feeling Warner might surprise me. Maybe not, but he sure knows how to bring the heat as well. Tahereh Mafi definitely knows how to write a book. She is able to write a story where girls are able to feel strong, vulnerable but most importantly feel human. I am excited to continue this journey with Juliette, Adam, and potentially Warner and most importantly I am glad I do not have to wait as long as the people who first read this story will. 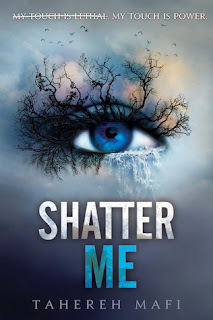 Shatter Me is an action-packed, dystopia novel that will leave you wanting nothing but more. Mafi is brilliant. I give this novel 5 souls!